Here's the bad news: Stocks closed the year with a small haircut. The Dow shed 160 points on the last day of the year as investors worried about falling oil prices and what that might mean for profits of the energy sector. But here's the really good news: If you put your money in stocks in 2014, you were a savvy investor. The Dow finished the year up 7.5%, the S&P 500 rose 11.4%, and the tech-heavy Nasdaq soared 13.4%. 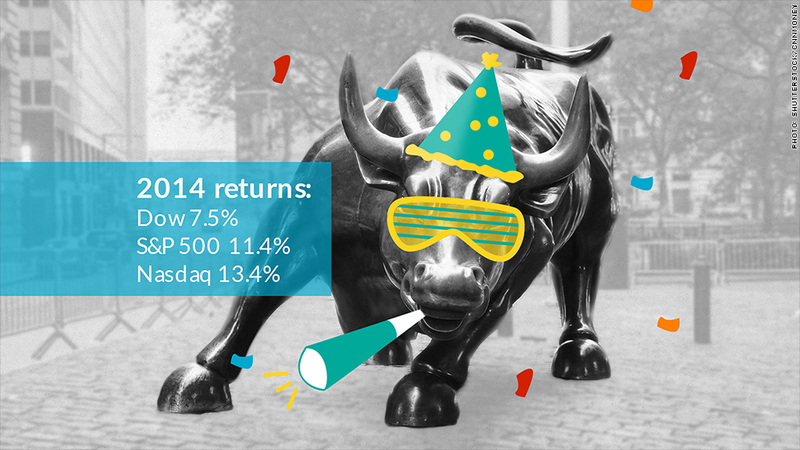 This was the third straight year that the popular S&P 500 Index scored double-digit gains. We haven't seen that kind of a winning streak since the late 1990s. There's no other way to say it. It's a Raging Bull market. Despite some worrisome news this year -- from Russia invading Ukraine, Ebola, ISIS, oil and some Federal Reserve missteps --stocks always rebounded. In fact, the best market days of the year occurred in December. The bottom line is that stocks moved higher because the U.S. economy just kept getting stronger, and corporate profits grew with it. This was the best job year for job gains since 1999. Unemployment started the year just below 7%. It's now at 5.8%. Economic growth is accelerating in the United States, and inflation is not a concern. Utilities were the best performing sector in the S&P 500, followed closely by health care and technology. Companies have tremendous amounts of cash on hand that they used to buy up other businesses and invest in new technology and products. "The story of the U.S. stock market since 2011 has been one of steady profit growth augmented by a 60% P/E multiple expansion," wrote Goldman Sachs in a recent report. There were certainly some concerns, and U.S. government bonds -- often the safe haven investment -- had an unexpectedly good year. But gold, another proxy for investor fear, ended the year flat. What will happen in 2015? Experts predict the New Year will be another positive one for stocks. 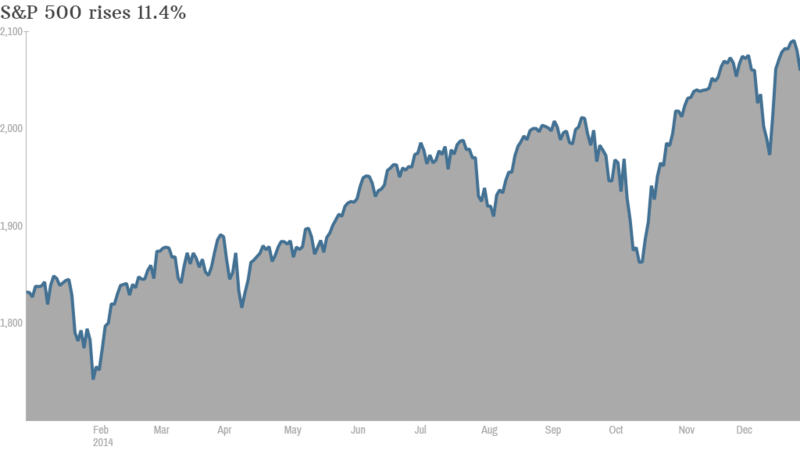 CNNMoney's survey of investment strategists predicts a 5.5% rise for the S&P 500 next year from its current level. "Our research indicates we are in the midcycle phase of the business cycle," says Chris Hyzy, Chief Investment Officer at U.S. Trust. But the headwinds will also pick up. Just how low oil falls and how long it stays in the $50 a barrel range (or lower) is clearly a concern. Europe is fighting off another recession, and China is slowing down. In an interconnected world, those countries could begin to drag the U.S. down at some point. The Federal Reserve holds the keys to interest rates, and stock market players are watching it closely. America's central bank has heavily signaled that it believes the economy is doing well enough for it to raise interest rates off of the historic lows at some point in 2015. Timing that first interest increase correctly could be the make-or-break moment for stocks and the economy.